Brand new innovative combined rapid test to simultaneously detect the enzyme biomarker M2-PK and human haemoglobin for improved colorectal cancer screening. M2-PK is an innovative biomarker, which has been identified as a key metabolic enzyme in colorectal cancers and polyps. The dimeric isoform of M2-PK is completely independent from the presence of faecal occult blood and specific for a change in glucose metabolism, which occurs in tumours (direct testing). M2-PK is an ideal screening marker to discover even the early stages of colorectal cancer because it can detect both non-bleeding, as well as bleeding, polyps and colorectal cancers. The modern immunological faecal occult blood test (iFOBT) for the detection of human blood (haemoglobin) uses a totally different approach from the M2-PK test. It is based on the presence of a source of bleeding in the bowel (indirect method). The iFOBT, which exclusively uses antibodies specifically targeted at human haemoglobin, has been clinically proven to detect more bleeding-associated colorectal cancers and polyps than traditional guaiac-based FOBTs (gFOBT). Its superior specificity for lower gastrointestinal bleeding compared to gFOBT reduces the number of false positive test results, making it an improved screening tool for the presence of human haemoglobin in the faeces from bleeding colorectal cancers or polyps. 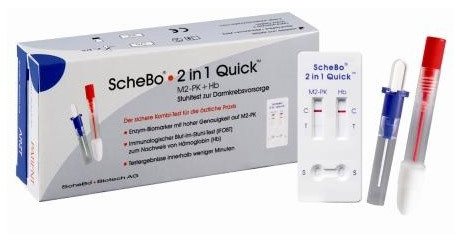 The ScheBo® • 2in1 Quick™ test is a brand new colorectal cancer-screening test, which can detect colorectal cancers and polyps by simultaneously using direct (M2-PK) and indirect methods (iFOBT). An innovation, the ScheBo® • 2in1 Quick™ test is able to detect both non-bleeding and bleeding colorectal cancers and polyps. Please check with ScheBo Biotech if this product is available in your country.